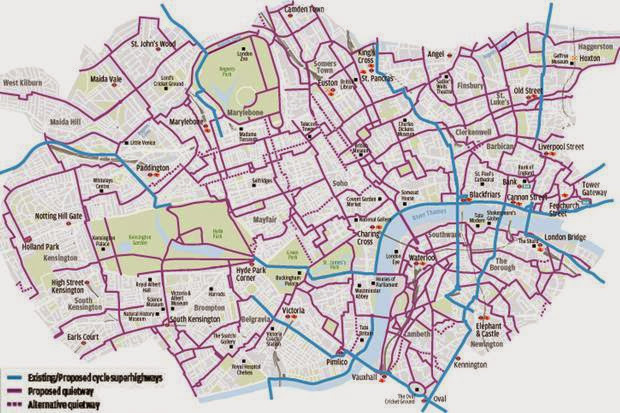 I'm starting to hear some fairly interesting noises about the central London cycling grid, a proposed network of "routes for people who want to cycle slowly, in their ordinary clothes, away from most of the traffic". Phil Jones, the councillor responsible for transport in Camden council (and a great protagonist of the recently-launched Royal College Street cycle way pictured above) announced on twitter that the Royal College Street scheme will be extended next year (I believe up towards Kentish Town and down into central London). He also hinted at restrictions to motor traffic on Tavistock Place - the hugely popular east-west bike route across Bloomsbury. That bike route is operating way above the capacity it is built for with big queues of people cycling in the morning along very narrow and weirdly-laid-out bike tracks. 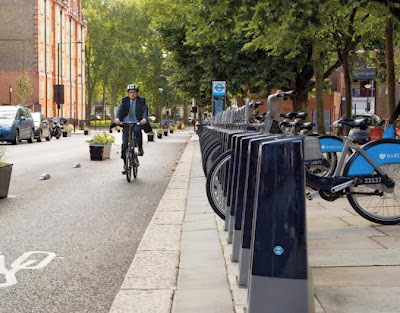 By reducing through motor traffic here, the council can provide much better infrastructure for cycling and enable greater capacity of bikes than the route can currently handle. Also in Camden, cycling will be finally be allowed on the contraflow bus lane that leads between Theobolds Road and New Oxford Street. This is really overdue. The changes should come into effect in the New Year. As Voleospeed blog points out, cyclists already use the bus contraflow because it is safer than having to fling yourself around the madness of Holborn gyratory but they are consistently being fined by the police for doing so. This is practically the only section of bus lane in London that is out of bounds to people on bikes as well and it is completely ridiculous it was ever allowed to go ahead on this basis in the first place given there are near identical road layouts elsewhere where bikes are allowed (think London Road near Elephant & Castle). It is good that Camden and TfL are finally rectifying this insane situation. As I've stated in previous posts, however, it is by no means clear that this sort of thinking is going on in all the central London boroughs. Many parts of the grid that go through Westminster are a bit of a shambles and wiggle around complicated one-way systems. Worse than that, though, is the fact that Westminster quite clearly states it won't be building anything like the standards that the London Cycling Campaign is calling for. In fact, Westminster makes very clear that it will not consider implementing anything that makes it 'harder' for other types of vehicles to get around. In other words, people will end up having to cycle down taxi and white van ratruns in Westminster but they'll be able to cycle on calmed streets in Camden that don't allow through motor traffic and are therefore much less busy. What's more, Westminster makes it pretty obvious that it thinks kerbside deliveries are more important that protected cycle lanes on busy main roads. 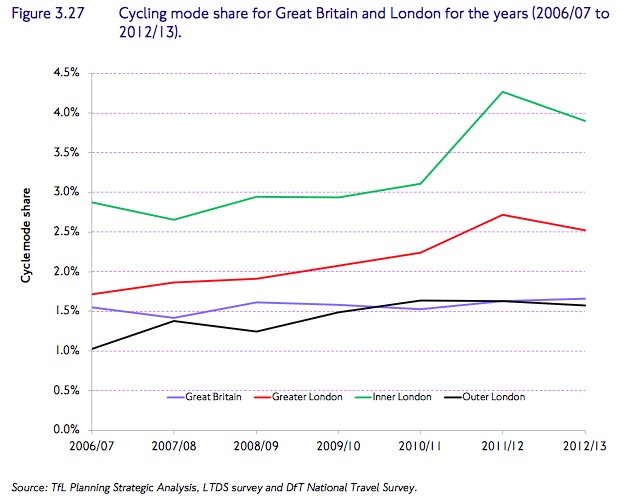 Cycling mode share in London is beginning to flat line. This situation has to change. 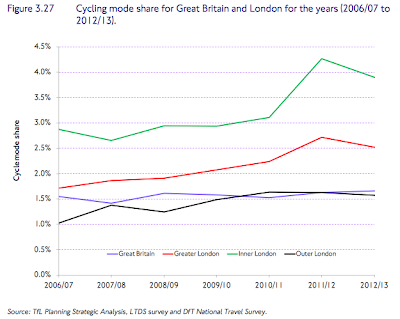 If you look at the figures releases last week, cycling in London has suddenly begun to flatline. It's well worth having a read of the review in AsEasyAsRidingABike blog. The latest stats also show by the way is that the number of bus journeys is suddenly in decline for the first time in over a decade and private car use is beginning to actually increase in outer London. I have to think that these are the result of policy decisions by the Mayor. It is absurd that bus use is declining and private car use increasing while bike use is flatlining. Our city is getting more and more crowded as its population grows. A transport policy that discourages highly efficient use of roads by bus transport and bike transport while increasing car use is bad for congestion, bad for pollution, bad for business and, ultimately the result of short-sighted policy-making in the recent past. That needs to change. And local authorities like Westminster can't be allowed to pursue policies that further privilege motor traffic at the cost of bus and bike.